‍Montreal, Quebec, Canada, December 3, 2018 – MONARQUES GOLD CORPORATION (“Monarques” or the “Corporation”) (TSX: MQR) (OTCMKTS: MRQRF) (FRANKFURT: MR7) is pleased to report positive results from the feasibility study (“FS”) prepared by BBA Inc. (“BBA”) for the Wasamac Gold project, located 15 km west of Rouyn-Noranda, in Abitibi, Quebec. The purpose of this FS was to complete a review and compilation of the resources re-qualified in October 2017 by Roscoe Postle Associates Inc. (“RPA”), incorporate advanced mining designs by integrating the Rail-Veyor® technology and a paste backfill system, investigate processing options, tailings and water management facilities and assess the economics of this underground gold project. The technical report summarizing the results of the FS can be found on the Monarques website via the following link: Wasamac 2018 feasibility study. The results of the FS show that Wasamac is an economically viable project that is expected to be a low-cost producing mine. The FS also provides the basis for making a production decision and serves to fully support the permitting and financing processes. “As evidenced by these results, the Wasamac Gold project has the makings of a great gold mine,” said Jean-Marc Lacoste, President and Chief Executive Officer of Monarques. “The feasibility study is based on a top-down mining approach and the use of the Rail-Veyor® system through a twin-ramp access and haulage facility, which eliminates the hefty initial capital expenditures associated with building a shaft, increases flexibility in mine planning, shortens the timeline to production and allows us to significantly decrease the overall cost of the project. We also believe that we will be able to extend the Wasamac mine life, as the deposit remains largely underexplored at depth and along strike. The mineral resources used as the basis for the FS study are summarized below. 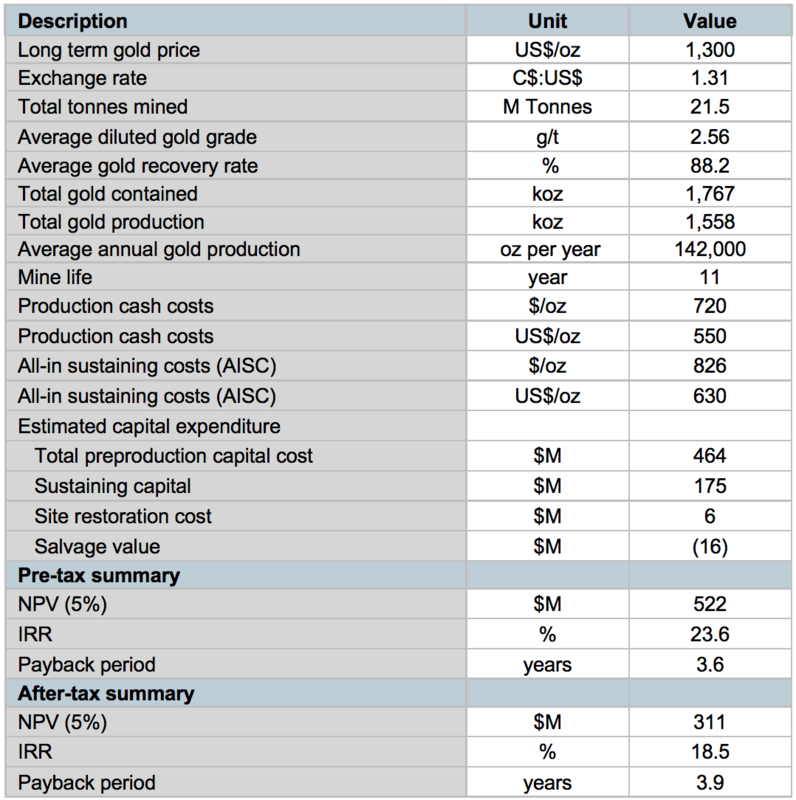 The mineral reserve estimate for the Wasamac deposit is based on the resource block model provided by RPA toMonarques in 2017, along with the information in the Preliminary Economic Assessment study conducted byRPA in 2012 for the previous mine owner, Richmont Mines Inc. There are significant opportunities that could improve the economics and the timetable of the Wasamac project. The major opportunities identified at this time are summarized in Table 25-4 of the FS. Further information and assessments are needed prior to including these opportunities in the economic evaluation of the project. Pending the completion of all studies and receipt of the required permits and financing, the process plant construction is scheduled to begin in Q4 2020 with full capacity production achieved by Q4 2022. The preliminary on-site workforce requirement for construction, including infrastructure, process plant, and development of the underground mine is expected to average 250 construction personnel, peaking at approximately 420 individuals in Q3 2021. It is anticipated that around 300 employees (staff and labour, peaking at 319 in year 2024) will be required for the operations over the life of mine. Carl Caumartin, P.Eng., BBA Inc.
Alain Dorval, P.Eng., BBA Inc.
John Henning, P.Eng., BBA Inc.
Richard Jundis, P.Eng., BBA Inc.
Luciano Piciacchia, P.Eng., BBA Inc. The technical and scientific content of this press release has been reviewed and approved by Marc-André Lavergne, P.Eng., the Corporation’s qualified person under National Instrument 43-101.